Well dear readers, it's been some time without an update. I blame my job for that. Seems that they want me to do things for money. For shame. Anyhoo, I'll do my best to get more then just one review a week. Knowing how you can't live without me. While it took me some time to get around to reading the latest issue of Talon, I'm glad I did. Hats off to James Tynion IV. His work is getting better and I'm glad to see he's not just another Snyder clone. Didn't Spider-Man teach us anything at all about clones? 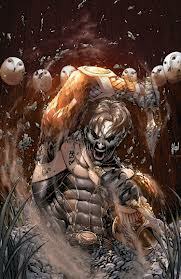 Calvin Rose's body is found by the Court of Owls and they begin the process of bringing him back to life. Now with only the extreme cold to harm him, the Court of Owls holds Casey and her daughter hostage to make Calvin kneel like a dog. Oh, and do their bidding too, can't forget that. The Court is going to reprogram Calvin and when that's done they will send him to kill Sebastian Clark.